Katherine W was seven when her third-grade teacher issued Chromebooks to her class. 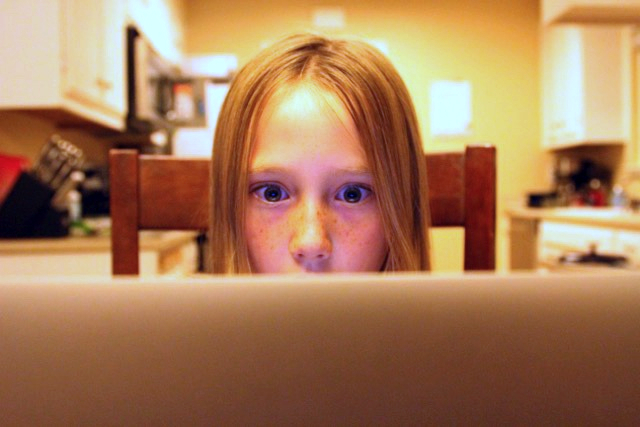 Her dad, Jeff, is a serious techie, but the school's tech choices didn't sit well with him. He was able to get Katherine an exception that let her use a more private, non-cloud computer for the year, but the next year, Katherine's school said she would have to switch to a laptop that would exfiltrate everything she did to Google's data-centers. The rules around data-collection and kids are complicated and full of loopholes. Though they seem, on the surface, to forbid Google from creating an advertising profile of kids using school-issued laptops, the reality is that kids are profiled as soon as they click outside of the Google education suite -- so when a kid watches a Youtube video, her choice is added to an advertising profile that's attached to her school ID. Jeff worked with the Electronic Frontier Foundation to negotiate Katherine's right to keep using non-cloud computers in school, with better privacy protections for her. EFF has published a guide for students to improving Chromebook privacy settings, too -- so if your school makes you (or your kids) use Chromebooks, you can make good choices about keeping your data private. That’s when EFF reached out to the district. Our legal team drafted a letter to the Roseville City School District to outline the privacy concerns associated with school-issued Chromebooks. The letter urged the district to permit “all students – if their parents so decide – to use alternative devices, software and websites, for the upcoming school year and every year.” The district refused to meet with us to discuss the issue. For Jeff, the biggest concern isn’t just the data Google collects on students. It’s the long-term ramifications for children who are taught to hand over data to Google without question. It’s normalizing the next generation to a digital world that’s less private by default, and built on proprietary software.